To begin with, the original article has contradictions. 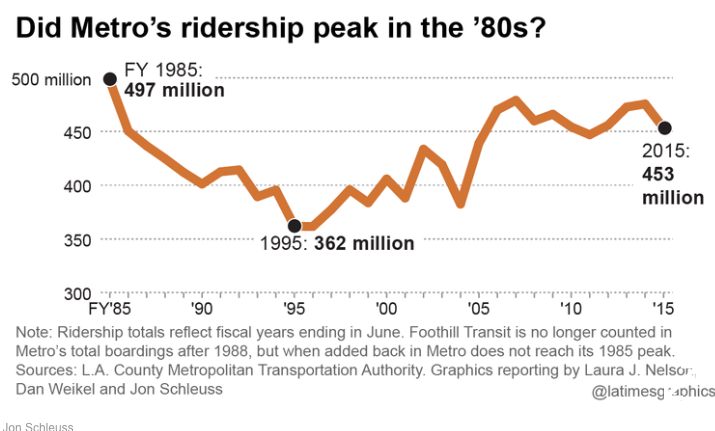 Its main point is that recent investments haven’t had a positive impact on ridership, but the article itself includes a chart that shows that since 1995 Metro ridership has increased from 362 million boardings per year to 453 million, an increase of 25 percent. When did the Blue Line, L.A.’s first new rail line, open? In 1990. When did the Red Line subway open? 1993. Green Line? 1995. Gold Line? 2003. What do you know, but there’s a correlation between when L.A. began investing in a modern rail system and when ridership began to increase. This entry was posted in Uncategorized and tagged Bruce Feldman, Ethan Elkind, James E. Moore II, Metro ridership, transit ridership by Frank Gruber. Bookmark the permalink. Bravo Frank! I can’t wait for the new expo line to open, so I can take it from Santa Monica to work. Of course I am one of those academic intellectuals with no sense who teaches at USC,. I really agree. LA needs to get past the whole car culture. In order to house everyone, we are going to be denser. Some people seem to think self driving cars will solve everything, but they won’t. We simply cannot put more cars on the road, even if they are self driving. Automobiles are a very inefficient way to move large numbers of people around. We really need to use mass transit to move people faster and more efficiently. It’s really not about public transit or cars. The city we have (in LA) does not work with more people, IF they drive. So, we can either build a moat around ourselves and keep new people out, or we can build a different city. SM is close to being an example for that different city already. Once the Expo line will run, I hope the rest of LA will take note and see how well a small city WITH transit, and a pedestrian core next to it, can work. Let’s hope SM can lead the way back to sanity. Gerhard — that’s a good way to put it, that L.A. doesn’t work with more people if they drive. We’re not going to build a parallel 10, a parallel 405, a parallel 101, etc.